I found foundation one of the hardest make-up items to buy and usually religiously use one product that I know I can rely upon. 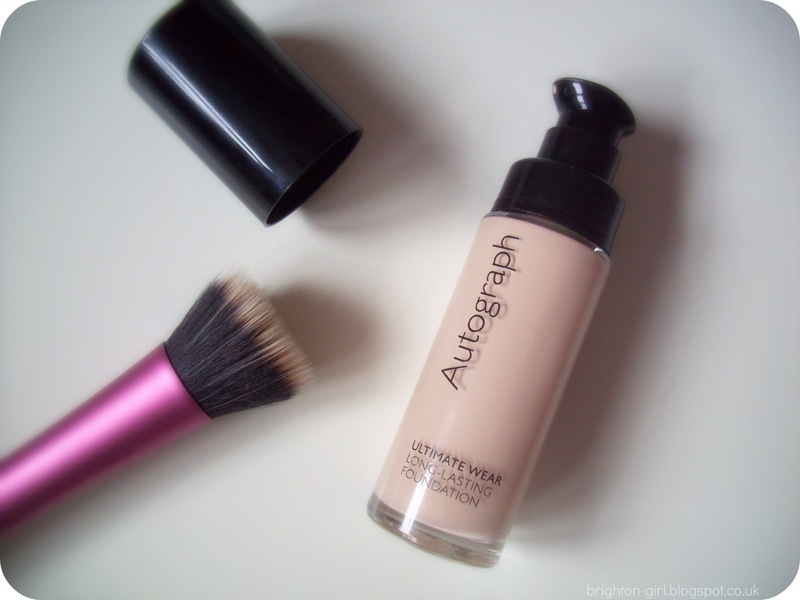 I picked up the Autograph Ultimate Wear Long-Lasting foundation on my last visit to Marks and Spencer (you can read all about this here). I've been wearing it every day for the past three weeks and thought it was about time to share my views on my latest makeup purchase! For the past year or so I've been using Mac's Studio Fix Fluid. However, when my latest bottle began to run out I made the decision to look for something cheaper. I'm in the process of changing my spending habits when it comes to make-up and skin care. I'd rather splurge on items that are going to treat my skin's issues rather than on products that are just going to cover them up. Autograph's Ultimate Wear foundation is £12 for 28ml, compared to £20.50 for 30ml of Studio Fix Fluid. Upon swatching the foundation in store, I was pleasantly surprised. I went for Ivory and it's a good match for my skin. Although I would say that it does oxidise on the skin slightly, which is something to look out for. The Ultimate Wear provides medium-to-full coverage but is certainly buildable. I apply mine using the Real Techniques Stippling Brush, first of all stippling the product over areas that I need more coverage (T-zone) and then softly blending it out. The finished look is flawless looking skin, with any imperfections or redness blurred and covered. I set the foundation with Rimmel's Stay Matte powder, in Transparent, and find that it lasts all day. This also ensures more of a matte finish as the foundation alone gives a slightly dewy appearance. Overall, I couldn't be happier with Autograph's Ultimate Wear foundation. I had been rather sceptical about spending less on something so important but I can see this becoming my new staple base product! Have you tried any of the Autograph range at M&S? I didn't even know M&S had a beauty range, this sounds like a lovely affordable foundation, I'll check it out! Re: oxidation. If it's turning orangey on the skin, it may be a sign of dehydration. A quick way to check the hydration of your skin is to place your index finger along your cheek and push up (not IN!). If you can see faint lines - sort of like a brick wall - then your skin is dehydrated. Ensure that you are drinking enough water and using a good moisturiser day and night, accompanied by a serum if needs be. I know lots of T-zone sufferers want to leave out moisturiser (thinking that oily & hydration are the same thing!) but a good balancing moisturiser might be a problem solver!